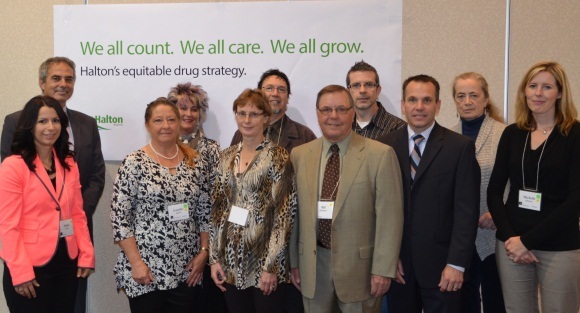 On October 8, Halton Region hosted the Halton Drug Strategy Community Forum to begin the process of developing a comprehensive, community-driven drug strategy. 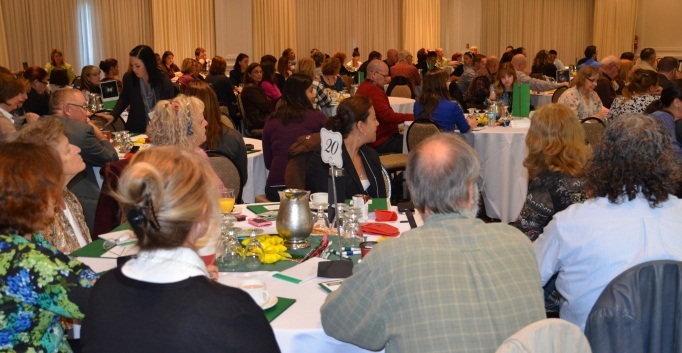 Over 150 participants from more than 30 sectors brought their expertise and passion to the day to identify top priorities for Halton, and discuss possible solutions to address the issue of substance use in our region. The process started approximately a year ago after I attended a meeting hosted by MPP Kevin Flynn,which brought together concerned citizens and service providers to talk about the Province’s Mental Health report and discuss how to address substance use at the local level. At that meeting there was key interest in working with key partners in our region to coordinate a results driven “made in Halton” strategy. Shortly thereafter, a steering committee formed with representation from Halton Region, four key stakeholders (Mississauga Halton LHIN, POSSE Project, Adapt Halton, Halton Regional Police Service), and two individuals with lived experience. The committee began the process discussing initial ideas for a Halton strategy and soon started planning a community forum. But it was the four diverse personal stories interspersed throughout the day that reminded everyone in the room why a drug strategy is important. The stories ranged from personal struggles with addiction and mental health to a parent’s perspective of losing a child to an accidental overdose. Each story was powerful and provided inspiration to this collaborative process. I want to thank everyone who took the time to attend the forum. The passion and dedication of the individuals and the organizations represented prove once again that Halton Region is a great place to live, work, raise a family and retire. We are leaders in providing a high quality of life to our residents, and with the expert agencies and community members who came together today, I am confident the result will be a meaningful community based and driven drug strategy that will build on the great work already taking place across Halton Region. Presentations, photos and more information from the forum can be found at www.halton.ca/drugstrategy. A summary of the day’s events will also be posted in the near future. On August 7, I had the pleasure of joining with Oakville Regional Councillor Alan Johnston and Milton Regional Councillor Colin Best in attending the Annual Joint Chambers of Commerce Business After 5 networking event at the Halton Regional Centre in Oakville. 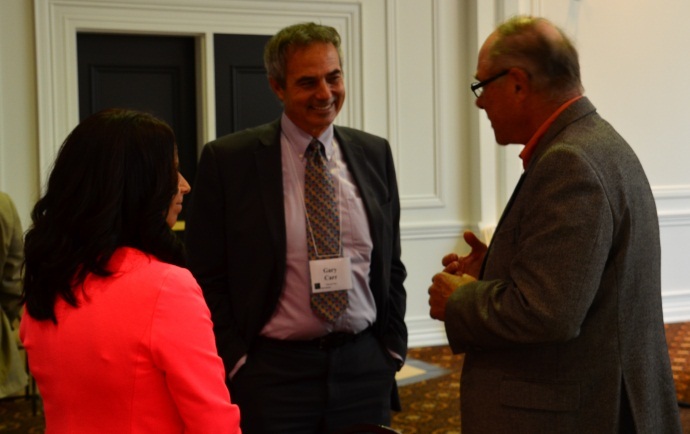 Organized by Halton Region’s four Chambers of Commerce together with Halton Region’s Small Business Centre, the event brings together chamber members and guests for networking with members of other Halton Chambers of Commerce. This well attended networking event is combined with a Business Showcase that serves as a mini-tradeshow. Local companies, including some former Small Business Centre clients and this year’s Summer Company participants, have the opportunity to showcase their products and services and share stories with other members of the small business community. There is always an incredible buzz in the room and a genuine feeling of goodwill. It is one of my favourite networking events. Where else could you chat with the heads of all four Chambers of Commerce, have a free caricature drawn while you wait, sample roasted chickpeas, and consult with a business coach for 5 cents? I am incredibly proud of Halton Region’s local business community. It is thriving and diverse, thanks to the efforts of the Chambers, our Local and Regional Councils and the individuals who work so hard each day to bring their new ideas to market. More and more small business are opening here in Halton, joining larger businesses such as Siemens, Toronto Premium Outlets, Lowes Canada and Gyptech Technologies. They are locating here because of our quality of life, our solid infrastructure and because of the very talented people who live and work in this community. American industrialist Henry Ford once said, “Coming together is a beginning; keeping together is progress; working together is success.” Meetings such as the annual Chamber event help ensure we continue to come together, stay together and enjoy success together. One of the great things I get to experience daily as Regional Chair is the opportunity to meet people in Halton who are making important contributions to the lives of others in the community. We have a vibrant non-profit sector with thousands of volunteers who provide community programs and services to people of all ages in Halton. Each year Halton Region invests over $700,000 through the Halton Region Community Investment Fund to support community based programs and projects that provide community health and social services. The investment fund makes it possible for these programs/projects to expand their service, enhance their equipment or even try something new (pilot projects). I have been able to visit some of the programs we have funded and I am always impressed by the dedication of the volunteers and staff working in the various programs. On July 10, Regional Council approved the 2013 allocations for the investment fund. We have provided one-year grants to 16 programs/projects and have approved second year funding (as part of the 2012 multi-year funding) for another eight programs. The total amount awarded for one-year and multi-year funding in 2013 is $761,594. Funding this year is supporting innovative initiatives including a mentoring program to support children of newcomers; a financial counselling program to help people with low income who are being treated for cancer; and renovations to five affordable housing units to make them accessible. For a full listing of the programs/projects being funded this year visit www.halton.ca/investmentfund. Halton Region’s Community Investment Fund is an action item in the Citizen’s Priorities – Halton Region’s 2011-2014 Action Plan. To see two of the programs we fund in action, please watch my video blog about the investment fund. For more information about the Halton Region Community Investment Fund dial 311 or visit www.halton.ca/investmentfund. Halton Region works closely with our emergency partners to be ready to respond to emergency situations. We take our responsibility very seriously and are committed to ensuring that we are ready to respond to any emergency situation and are able to reach as many people as possible. Since 2008, we have used our Community Emergency Notification Service (CENS) to phone and deliver a message to affected households in the Region in the event of an emergency. We continue to improve CENS so that Halton Region remains a disaster resilient community. On June 19, 2013, Halton Regional Council passed a motion to incorporate Bell Canada’s Enhanced Community Notification Service (eCNS) into the Region’s existing notification service. This new initiative will increase the reach of Halton Region’s CENS from 60 per cent of traditional land-line telephones within the Region to more than 95 per cent. When the system is implemented in November 2013, the Region will be one of the first Canadian municipalities to have access to Bell’s reverse 9-1-1 data and the first to use geospatial coordinates (latitude and longitude) for civic addresses in the 9-1-1 database for the purpose of emergency community notification. Access to this “geospatially enhanced” 9-1-1 information will allow Halton Region to accurately notify only those households impacted by an emergency event. Bell’s eCNS will supply a greater range of telephone numbers and addresses, including unlisted and do not call numbers. However, wireless telephone numbers (cell phones), four party lines and nomadic Voice over Internet Protocol (VoIP) telephone services and devices for hearing-impaired users will not receive notification through eCNS. Residents who are using these other services in their homes will be notified through other communications from Halton Region. The initiative is a joint effort between the Region, the City of Burlington, the Town of Halton Hills, the Town of Milton, the Town of Oakville, Bell Canada and Telus Communications Company. For more information about eCNS and Halton’s Emergency Management Program, dial 311 or visit www.halton.ca/beprepared. You can also follow Emergency Preparedness on Twitter for emergency updates and preparedness tips.